Caserita.com is a website selling Bolivian handicrafts. It is a small company located in La Paz (the administrative capital of Bolivia) with the principal objective of promoting Bolivia and the products of its artisans. The name "Caserita" is typically Bolivian. It is an affectionate name given to people you buy from on a daily, routine basis, for example, the lady who sells bread every morning in the little store around the corner, the person who brings your newspaper or any other friendly, cordial vendor with whom you may have a commercial relationship and whom you treat with familiarity. We picked this name since, besides disseminating Bolivian culture, we hope to have this type of relationship, of trust and familiarity, with our customers and suppliers. Caserita.com's story begins in 2003 when Giovana, a marketing engineer who is passionate about the Bolivian culture, and Pierre, a French computer engineer and experienced web master, decided to throw themselves into the venture. At first they showed a few products purchased on Sagárnaga Street (the La Paz artisan street) and little by little, thanks to the quality of products and service, they began to increase their customer base. Now Pierre works exclusively on the website and Giovi maintains contact with the artisans (families, associations and independent craftspeople) with whom solid and enduring relationships have been established over time. Year after year, our product sales grow thanks to our artisans who propose new items, our customers' demand and our team which has been expanding our reach so that we offer not only products from the Andean region of Bolivia, but products from the valleys, southern part of the country, the tropics and Amazonian region that we have today. The purchase of each product brings you a little closer to knowing Bolivia, its art (traditional fabrics and typical musical instruments) and raw materials (alpaca wool, llama wool, sheep wool, wood, leather, plants, etc.). Each month we send our customers a bulletin with an article on Bolivia (its history, geography, tourist attractions, etc. 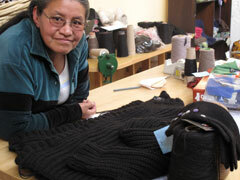 ), an interview with one of our artisans and descriptions (with photos) of our new products. In view of the success we have achieved and motivated by an interest in promoting Bolivia, we have taken into account our customers' suggestions and are inaugurating our Bolivia Information Site and the wonders of Bolivia: caserita.info. Besides providing the most relevant information about the country, the site will give you an opportunity to participate by sending us material (articles, photos, comments, opinions, etc.) 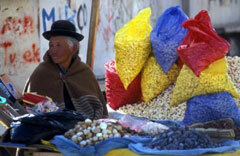 you wish to share about Bolivia and by leaving comments on our articles and participating in our forums. Finally, all our projects have been made possible by you, our customers. Therefore, we want to take advantage of this opportunity to thank you for your preference and loyalty over the years.